Delaminating sealer appears as a white film several days after application. Remove 90 to 95 % of antiquing release to ensure adequate adhesion and great looks. Stamped concrete is an aesthetically appealing product. But it’s not exactly concrete “by the books”. There are compromises in all of life, and we give up a lot in order to achieve the distinctive look associated with stamped concrete. After all, stamped concrete isn’t placed, finished and cured in a way typically consistent with ASTM specifications or ACI guidelines. Stamped concrete is also more expensive than your average broom finish. Not surprisingly, those cosmetic improvements aren’t free for the ride. Like all decorative concrete, stamped is held to a higher standard of appearance… customers want good value for the extra cost. Blemishes that might go unnoticed on broom finished, precast or troweled concrete take on a far greater significance on stamped. One such blemish is “delamination”, or a disbonding of a decorative sealer from the concrete substrate. Delamination looks like a “whitening” or hazing as the sealer lifts from the concrete surface, and has two main causes on stamped concrete. One source of delamination is the use of release agents. Powder releases are made with hydrophobic (water repellent) stearates (soaps) and liquid releases are often oil based. Both prevent polymer stamps from sticking to freshly placed concrete and serve the dual purpose of providing an antiquing element to highlight the recesses and joints inherent to stamped concrete. Unfortunately, releases that prevent polymer stamps from sticking to concrete also prevent polymer sealers from sticking to concrete. As a result, it’s absolutely necessary to remove 90-95 % of all releases during the power washing stage, prior to applying a decorative sealer. If excess release remains on the surface, the sealer will be unable to bond with the concrete surface, resulting in delamination of the coating. The delamination may take place in localized areas of excess release, or across the entire substrate surface. The second major cause of sealer delamination on stamped concrete is over application. It may seem logical that if a little sealer is good, then a lot has to be better, but that’s not the case. Concrete is porous, and there’s always water vapor passing up through the substrate. This water vapor also has to pass through the sealer (measured as a moisture vapor transmission rate, or MVTR), or it will condense and accumulate (think of holding a piece of cellophane over a boiling pot of water). As that vapor condenses, it forms a pressure under the sealer which can force the sealer to disbond from the concrete surface. In extreme cases it can even cause failure of the top paste layer. It usually takes a few days after sealer application for enough water (and pressure) to accumulate, which is why that “whitening” magically appears several days after sealing has been completed. 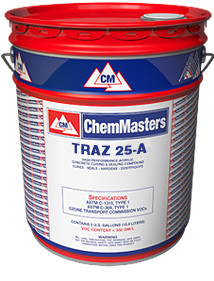 Over application of sealer is more pronounced with fast evaporating low-VOC products. As those solvents evaporate quickly, it raises the percentage of solids (acrylic plastic) that are being deposited on the concrete. The problem is made worse when fast solvent evaporation causes stringing or “cob webbing” on the roller. When this occurs, it’s natural to re-wet the roller in more sealer, thereby applying a thicker coating than intended. Remove 90 to 95 % of powder release during the power washing stage. Apply the decorative sealer in thin coats. Carefully adhere to the manufacturer’s recommended application rates. Use a slow evaporating product like ChemMasters’ Polyseal EZ or Stamped & Decorative Concrete Sealer 400-A in areas requiring low-VOC formulations. Clean your roller cover with xylene (or xylol) if stringing or cob webbing occur, rather than re-dipping into more sealer. Work in small, manageable areas. Saturate them with xylene (or xylol) and allow to dwell for several minutes. This will re-solvate the disbonded sealer. Dampen a roller cover in xylene (or xylol) and gently back-roll the area. This will redeposit the sealer directly to the concrete surface. Repeat if necessary on localized areas. In most cases this will solve your problem. Severe over application may require some coating removal. If needed, scrape excess sealer off the roller cover during back-rolling operation.